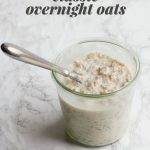 This classic overnight oats recipe is simple, easy, and delicious on its own. The rest is up to your imagination and what you have in your kitchen! Whisk together all ingredients in a medium-sized mixing bowl. Spoon into a jar with a tight-fitting lid. Close and refrigerate for at least 4 hours, but preferably overnight before eating.